Five Questions on Discipleship: (5) Why Should You Make Disciples? Thus far we have asked four questions about discipleship: (1) What Did Jesus Do? (2) What is a disciple? (3) Who makes disciples? And (4) How do you make disciples? Today we finish by simply asking the question, Why? Why should you make disciples? Let me give five answers that will serve as great motivation for stepping out in faith to make disciples. First, It is disobedient to ignore this command (Matt 28:19). The Great Commission is for every born-again believer in Jesus Christ. To ignore this command is to ignore the heart of Jesus. Making disciples is not an optional aspect of the Christian life for a select group of Christians. It is part and parcel of every Christian’s calling. Some may be more gifted at it than others, but all are called to be participants. Second, the presence of God is found in it (Matthew 28:20). The promise of God’s nearness is not found in your daily devotion or in a cabin retreat. It is found in the ministry of making disciples. While such personal times of reflection are sweet, God’s word promises more emphatically his presence when we are laboring with him in finding, winning, and growing the sheep that Christ has purchased with his own blood. Third, the promise of success is given in this task. (Matthew 16:18). Disciple-making is guaranteed to work. Sure, there will be many who you meet and minister to whom may fall away. However, there will be others who will have their place marked out in heaven because of your willingness to serve. You cannot save anyone, but God has chosen to use means (you and me) to build up his church. And like the Father’s promise to the Son that his death would effect the salvation of his children, so we are given the promise that our labors will not be in vain (1 Cor 15:58). The word of God never returns void, God has guaranteed that his church will be built, and he has shown us that this building comes through disciple-making. Fourth, your greatest Christian joy will be had in disciple-making (1 Thess 2:19-20). Just ask Paul. His glory and joy were found in the men and women that he won to Christ and established in the faith. His greatest anxiety was seeing disciples he had invested in turn from Christ. Truly, if you are a Christian, this will be the source of your greatest joy, too. The treasure you are to lay up in heaven is people–those whom you lead to the Lord and help along the way will be your greatest joy. Fifth, churches grow as we make disciples. The truth is, only disciple-making guarantees church growth. The one “product” that the church should be producing is disciples. Just read John 15:1-8. When the church abides in the Word of God (i. e. the gospel) and the gospel permeates that church, disciples will be born unto the glory of God. All other activities must be subservient to this main purpose. Therefore, block parties, special events, Power Team performances, and movies may draw a crowd, but they do not make disciples. 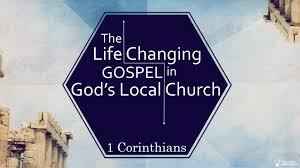 Children’s programming, bus ministries, friend days will get people in our building, but they will not make disciples. A cool website, newspaper ads, and yard signs will announce a church’s presence, but none of these things guarantee disciple-making. All of these events must be linked up with slower, more intentional process of life-on-life discipleship. If you commit to making disciples, you are committing to doing church in a more simple fashion. While many programs and activities may be going on at your church, only one thing is necessary–Jesus Christ and the preaching of his gospel in the context of loving relationships that are growing disciples. Similarly, if you commit to making disciples, you are committing yourself to slow growth. If you want an instant helper in the home, buy a robot. Don’t have a baby. Children take time to rear, but in the end there is great reward in seeing a baby become a boy become a man, one who receives and lives out all the priorities you instill in him. So it is with making disciple-making. While it takes time and comes with seasons of pain, slow growth in pouring your life (with the gospel) into the life of another will be impact disciples in ways programs cannot. Finally, if you commit to making disciples, people may wonder what you are doing to grow the church. After all, the point of church growth is larger numbers, right? It is true that numbers do provide a means of measuring the ministry, but perhaps we should find a quotient that divides the number of believers by the time that they stay and grow. Of course, this sort of metric is impossible, but in our discussions about numbers, we should add to the conversation not only how many converts are won to Christ, but how many of those converts are grown up to be soul-winners themselves. Or to use more biblical terminology, how many of the disciples made in your ministry are reproducing themselves? May we continue to let the Great Commission ring in our ears and reverberated in our hearts, so that disciple-making becomes a central feature of our personal lives and church ministries. ← Five Questions on Discipleship: (4) How Do You Make Disciples? When I am sharing and spreading the word of God or Gospel to other people. Because I want to express God’s love in me to others. And I know when I do that I grow more in God, more mature, more faith and more obedience to God as I teach others. It’s my joy to share the word of God.. Thank you Lord for the privilege.